It cost $12,972.06 to host MusicBrainz in 2007 — this includes hardware and hosting costs. PayPal donations, which represent end-user support for MusicBrainz, came to $14,575.59, 16.3% of our total income. The Foundation aims to have end-user donations pay for the actual cost of running the service and the end-users did in fact pay for slightly more than what it cost to host MusicBrainz in 2007! As it is with a lot of companies, salaries accounted for the largest slice of expenses. The Foundation paid $39,500 in salaries to Robert Kaye in 2007, which was still far below a reasonable salary level for an Engineer/Executive Director in California. $32,240.47 was earned licensing the MusicBrainz data for commercial use, which represents 40% of the total income. In 2007 the foundation spent $12,972.06 on hosting and hardware costs and served out 725 million web hits and 386 million web service hits. Calculating a cost per hit, we find that we spent $17.89 per one million web hits and $33.58 per one million web service hits. These values are up slightly from the 2006 values of $17.56 and $30.58 respectively. The balance sheet for the end of 2007 showed the MetaBrainz Foundation with $14,323.45 retained earnings, a net income of $25,101.75 and total cash assets of $39,525.20. The blue line represents the overall number of hits to musicbrainz.org. 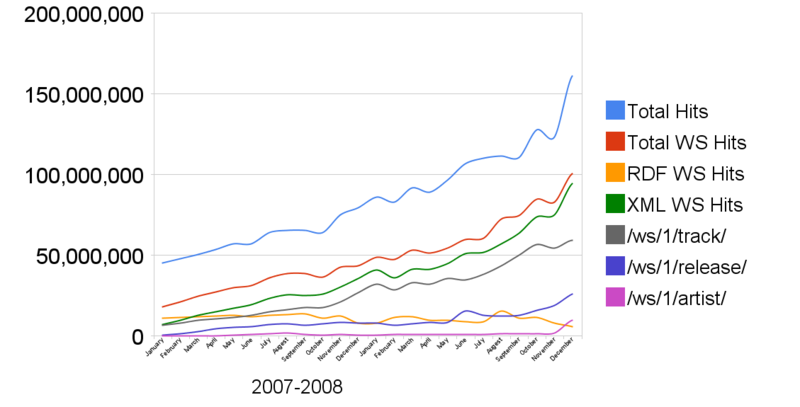 The red line shows how many of the overall hits were web service (API) hits; as you can see towards the end of 2007 half of our overall hits were web service hits. A big thank you to all of the editors/voters who contributed! Also, “In 2007 the foundation spent In 2006, $12,972.06 on hosting and …”? Thanks for the tip on the typo. Fixed. Previous Previous post: The Dashboard is back!